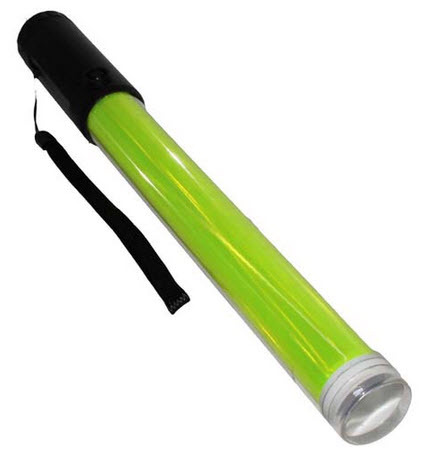 These illuminating Marshalling batons are the ideal tool for use in Marshalling aircraft, Vehicle control, Emergency services, Boating, Crowd control, directing traffic or signalling. One of the lightest wands on the market which renders heavy flashlights obsolete. You can comfortably perform your job with a wand that weighs in at just 165g (without batteries). Offering outstanding visibility with a visual range of up to 500m. Added to this the baton has a strong magnet within its base. This additional feature allows the baton to be positioned horizontally or vertically (including inverted) on any metal surface for hands free operation. Simple four mode push button operation. Flash On, Steady On, Torch On, Off. Made from lightweight shock and weather resistant plastics.